15 Life-Changing Psychology Tricks To Try. As our understanding of cognitive science and psychology steadily advances, we learn amazing new information that isn’t only fascinating in its own right but also capable of influencing our success and happiness. Some of this cutting edge data can be used to improve your internal life, while other research can transform your interactions with others. Here are 15 of the best psychology tricks to try—use them, and see how they can change your life! If you’ve asked someone a question but only received a partial reply, give them a few seconds. If you stay silent and hold eye contact, the other person will usually start talking again. This technique helps you avoid social awkwardness and helps you get the information you need. 2. To Immediately Feel Confident. You may be surprised by the effectiveness of adopting the “power stance”, i.e. standing with your legs apart and your arms spread out so that you cover as much space as possible. If you do this for just two minutes, you flood your body with testosterone and will instantly feel more self-assured. 3. 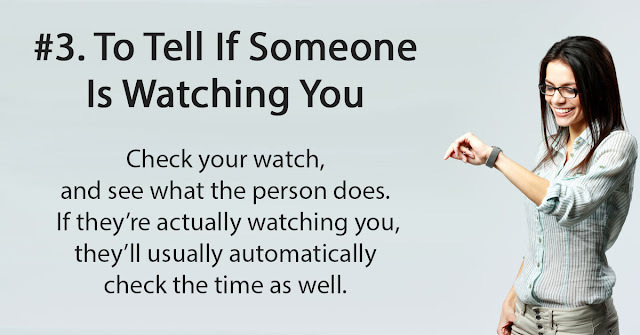 To Tell If Someone Is Watching You. Wondering if someone attractive is checking you out, or worrying that someone may be being nosy about whatever you’re doing? Simply check your watch, and see what the person does. If they’re actually watching you, they’ll usually automatically look at their own watch as well. If you suspect that a family member or a colleague is going to give you a hard time at a dinner or a meeting, deliberately choose the seat directly next to them. They’ll feel much less comfortable with the idea of being hostile if you’re so close, and the event will go much more smoothly for you. 5. To Judge Closeness In A Group. When you want to learn about relationships and alliances in a group of colleagues (or even in a family setting), be observant when everyone starts laughing together. Whoever a person first looks at is typically the person they feel the closest to. By noticing who you want to look at when you’re laughing, you can also learn more about who you really like best. 6. To Make People Like You More. Interestingly, asking people to do favors for you makes them more likely to like you more than merely offering to do favors for them. One theory is that asking someone for a favor indicates that you trust and value them, and they warm to you in response (because you’ve made them feel good). 7. To Convince People To Agree With You. If you need to be at your most persuasive, try nodding while you’re asking someone for something or trying to convince them of an important point. This subconscious cue is proven to make others more likely to agree with you. Memory tests show that we’re best at recalling the first and last things that occur in a series of events—meanwhile, what happens in the middle quickly becomes vague in our memories. So, if you’d like to be remembered at a job interview or conference, ask to be first or last. 9. Smile To Improve Your Life. As well as prompting your body to release feel-good chemicals that boost your mood, smiling is proven to have a positive impact on just about everything you do. It increases your confidence, makes you more optimistic, induces good feelings and promotes the development of new friendships. 10. To Make Yourself Seem More Important. Most people judge others with good posture to be more successful or powerful. So, straighten your back and keep your head held high if you’re at a job interview, doing a presentation, or networking at an event. Looking at other people’s poses and copying them will build trust and comfort between you. However, if you can’t do this subtly then it can be off-putting, so only mirror certain small aspects of the individual’s posture. 12. To Keep Everyone In The Same Place. If someone (or multiple people) are getting up to leave a meeting or event before you’re ready to finish, just hold your ground and stay seated. You’ll find that most others sit back down in response. 13. To Seem Friendly And Confident. Holding eye contact is good for forging connections, but most people start to feel uncomfortable if they deliberately try and sustain it for this purpose. To make it feel more natural while still reaping the benefits, try to assess the color of the other person’s eyes. This will ensure eye contact is sustained appropriately, but you won’t feel nearly as awkward! Silence can be a huge asset when you’re negotiating or bargaining with someone. Most people feel deeply uncomfortable with silence, and they will do anything to try and break it—even if that means giving ground in a major way. It can be tricky to store lots of people’s names in your memory banks, but you can make a great impression if you do your best to memorize names after they’re said only once. Make a point of greeting the person by name the next time you see them, and you’ll come across as appealing polite, socially gracious and charming. This article was republished from thelawofattraction.com. You can find the original post here.